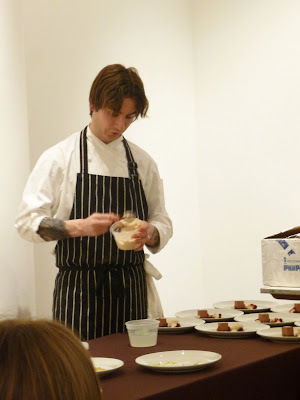 Dave Arnold (director of culinary technology) joined forces with pastry chef Alex Stupak (wd-50) for an evening of chocolate experimentation and tasting at the Chocolate & I event in Chelsea's art district on Friday. But what was served ended up being about much more than just chocolate. Nestled inside the delicious topic, the real point at hand was creativity and the art (or science, depending on how you argue it) of playing in the kitchen. Using drink and food, this was a romp through how both Dave and Alex work in the kitchen, playing with the known and familiar and making it unexpected and unfamiliar and pushing boundaries by using high- and low-tech methods. Both Dave and Alex beautifully demonstrated their individual approaches and philosophy towards creating and exploring in what they presented. Alex started us off with a white chocolate pudding, which he formed into a tube using acetate, filled with passion fruit caramel. 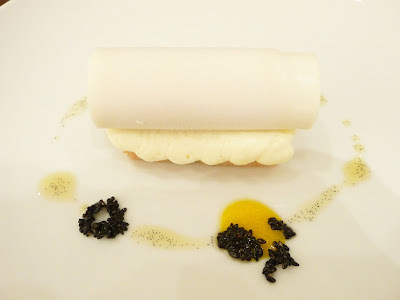 I personally like white chocolate best next to something tart and with passion fruit on the top of my likes list, it was difficult for me not approach this dish with a favorable prejudice. The caramel was only semi-liquid, making it oozy in a firm, controlled way. Placed on top of a white chocolate mousse over a financier made with argon oil, the contrast of textures and flavors created by the composition was accented with toasted black sesame dressed in argon oil with vanilla bean seeds and passion fruit puree for the finishing touch. The financier was marvelously dense and extremely moist. 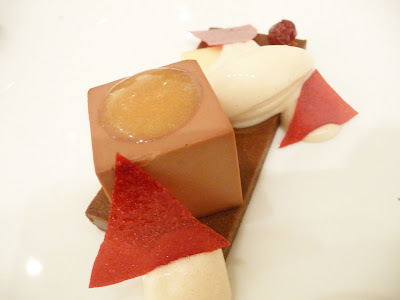 It added an interesting mellow note between the brightness of the fruit and the sweetness of the chocolate. 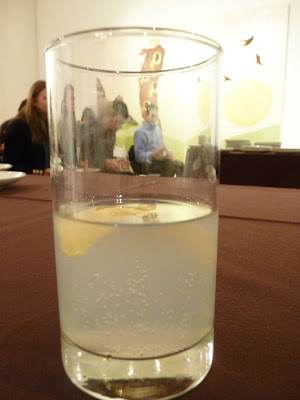 From there, Dave explained the first part to his Chocolate-Lemon Vodka. 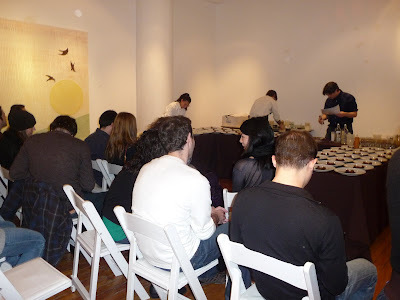 In preparation for the event, he blended cocoa to a paste and distilled it through a Rotovap. What is left is a clear substance that will gives all the flavor of chocolate but without any bitterness (the elements that lend bitterness don't distill), meaning that no sugar needs to be added to the drink. At this point, you have a chocolaty vodka with no color. Our drink lesson was then put on hold, and we went back to Alex, for our second dessert tasting: dark chocolate this time. A traditional toffee sauce was pooled in the center of each plate and surrounded by darkly flavored cookie crumbs, which Alex described as homemade Oreos—a super rich, dark chocolate dough made with egg whites but without flour. 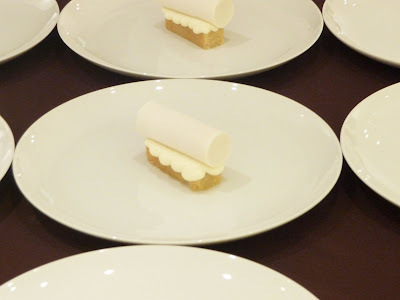 The round cylinders on the plate were nothing more than a soft ganache combined with agar-agar (a thickening agent made from seaweed) to make it sliceable. The marked note in the ganache was black cardamom. After the last crumb was mashed up by my fork and the plate scratched dry, Dave broke out with an explanation of the lemon (inspired by his wife's favorite chocolate pairing) portion of our drink. Fresh lemon juice was clarified until sweet and clear (with the help of agar-agar and a few other techy steps à la Dave). 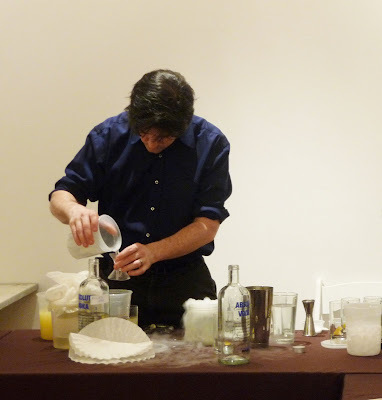 The juice-chocolate-vodka combo was then put over dry ice (as seen in photo of Dave above) to make it frizzante (less sparkling than Champagne) and simply garnished with a grapefruit twist when served. And I noticed, as with all of Dave's concoctions, these went down too fast, with tongues hankering for just one more drop. The sorrow in the audience caused by the cessation of drinking were sopped with Alex's final dessert preparation. 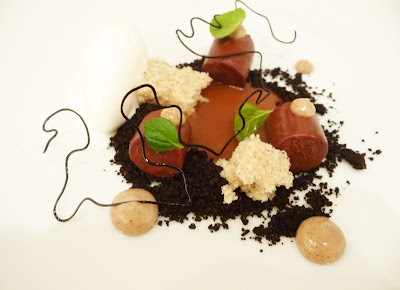 Milk chocolate was matched with bitter almond, dried cherry, and malted soy. I enjoyed everything I tasted during the evening, but this dessert is the one still haunting me in memory. First, soft milk chocolate and cream are combined to make a very thin ganache, which is then frozen in flexi-molds and thawed on the plate. The wonderful part is that it looks rigid (it's the block in the photo below) but is extremely smooth and pudding-like in the mouth. Malted soy dulce de leche is circled on top and the whole dessert is placed atop a cocoa sable. But as you may guess from the looks of it, this is no ordinary sable. Alex proclaimed that his sable technique was created to improve the texture of the ordinary sable; but like a Doubting Thomas I wasn't so convinced there would be an improvement until I tasted. Think of the finest wet sand you have ever run your toes between and that is something of what the texture you experience when eating this sable. It is loose and dense, buttery and chocolaty at once and incredibly delicious. And the process? Nothing more than chocolate sables that have been liquified and then chilled. (Sounds easier than it is, right?) The result is a substance that can be shaped into anything. So, much of what Alex does has to do with mouthfeel. There are flavors to work through but equal to that is texture. Moving from silky smooth to crispy to creamy to sandy engages your mind in such a way that you cannot escape taking note. 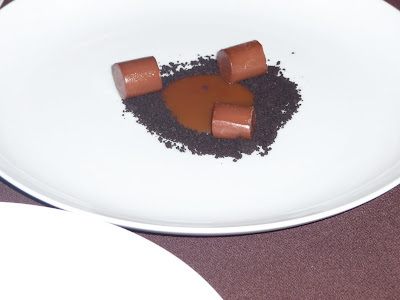 The rest of the dish is comprised of whipped soy milk, cherry puree that has been dehydrated at a low temperature until crispy, an almond gel made with the help of a pressure cooker, and a soy milk sorbet made with brown sugar and malted milk powder, which comes out with an ice cream-like texture because of the high protein content in the soy. Someone asks Alex how he comes up with his dishes. One way, he says, would be to create a dish around a new technique he has been working out (e.g. the chocolate sable). One new technique can then be paired with other familiar techniques. The other (easier way, he remarks) is by using flavor combinations. Easier, because knowing your ingredients directs you towards how to work with them—what is obvious, what is not. This is not as exploratory though, as flavor profiles are more set than techniques. Alex likes to use a flavor more than once on the plate and bring at least seven elements to each composition (a self-proclaimed nonminimalist), and here the discussion explodes, with Dave weighing in, into the idea of adding knowledge to a known body of work and looking for answers to a problem to set yourself free from the constraints the problem has created. Both Dave and Alex are huge proponents of learning (the genius of Wylie Dufresne) and figuring out how things work. While, Alex considers himself low-tech, relying on gums, acetate and the dehydrator to do his work, Dave loves the next high-tech tool. He likes equipment "that allows me to make delicious food in a different way than I did yesterday." And his main drive is curiosity and the resulting punching through of barriers. And, with a mind in perpetual motion, there appears to be a never ending supply of ideas for him to try out. It's always fun to eat and drink chocolate, but it's even better when it comes with a great conversation that sparks the imagination and gets one excited about the adventurous possibilities and effects of IOTA, carageenen, and, yes, maybe even a Rotovap. Liesel Davis is the editor of PastryScoop.com and currently a pastry student at The FCI. Her favorite form of exploration is eating. Can You Trust a Skinny Chef?